On Tuesday, several hundred people, including members of Occupy, showed up outside the Merchant’s Exchange Building in downtown San Francisco, where Wells Fargo was holding a shareholders meeting. Claiming they were protesting the bank’s alleged “greed” and involvement in foreclosures on homes, the group gave speeches outside the building, banged drums, and some tried to get into the meeting. Some were able to get in briefly but were then removed as they rose to disrupt the meeting once it started. According to Wells Fargo, the meeting proceeded as scheduled. Nine protesters were arrested outside the building on charges including trespassing and resisting arrest, said police spokesman Sgt. Michael Andraychak. All were cited and released except for two, who were booked on charges of attempting to hit sheriff’s deputies, he said. The blockade, intended to disrupt shareholders from attending the meeting, largely succeeded in becoming a nuisance to those that worked in the area. Anyone that attempted to pass through the chain of people were interrogated as to their profession and how much money they made. In one instance, a woman had to arguably explain that she worked for a non-profit before Occupy SF allowed her to go to work. Was this group a spontaneous grass roots flood of anger from the run of the mill person in the street? 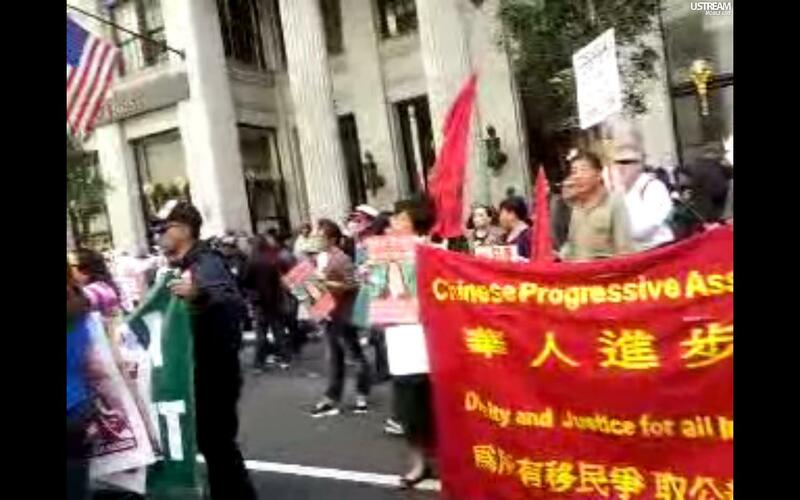 In additon to SEIU and the Chinese Progressive Association, there were signs from the CWA, Causa Justa, Code Pink, and Occupy. 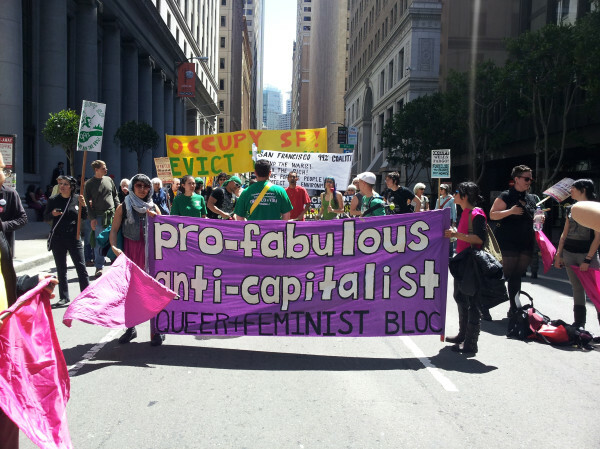 Oh and the “pro fabulous anti capitalist” Queer Feminist Bloc. 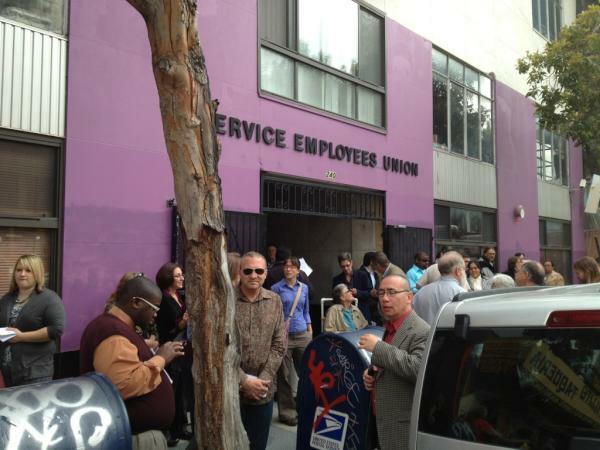 The numbers, however, were mostly SEIU women; once they left, numbers dropped appreciably. Even Ralanda King, the random quoted shareholder who came just for the meeting? Democratic politician and operative from Philadelpia. No grassroots to be found. As My Political Intervention notes, this effort was at least in part organized by ACCE – Alliance of Californians for Community Empowerment (ACCE). While some may not be familiar with ACCE, that is at least in part because they changed their name. ACCE used to be known as ACORN. ACORN derivatives can be found at many of the other Occupy operations, most notably New York, where it is manifest in the involvement of NYCC (New York Communities for Change) and the involvement of members of the Working Families Party. ACCE was involved with a similar protest against Bank of America in November, 2011 where people stormed inside the bank building at ACCE’s behest. In this video of the event by Lee Stranahan, you can see the organization behind their actions. But didn’t this all stem from outrage of the people in the Occupy movement? These efforts by the SEIU and others against the banks such as Wells Fargo and Bank of America have been going on for awhile and predate the Occupy movement. They don’t just involve actions outside of office buildings but marches on the private homes of people. Check this article from May 2010, where 14 buses of SEIU thugs went to the house of the deputy general counsel for BOA and frightened his teen aged son who called next door neighbor, reporter Nina Easton in a panic. What’s interesting is that SEIU, the nation’s second largest union, craves respectability. Just-retired president Andy Stern is an Obama friend and regular White House visitor. He sits on the President’s Fiscal Responsibility Commission. He hobnobs with those greedy Wall Street CEOs — executives much higher-ranking than my neighbor Baer — at Davos. His union spent $70 million getting Democrats elected in 2008. Now those strong-arm tactics, stirred by supposedly free-floating (as opposed to organized) populist rage, have come to the neighborhood curb. Last year it was AIG executives — with protestors met by security guard outside. Now it’s any executive — and they’re on the front stoop. After Baer’s house, the 14 buses left to descend on the nearby residence of Peter Scher, a government relations executive at JPMorgan Chase (JPM,Fortune 500). SEIU has said it wants to organize bank tellers and call centers — and its critics point out that a great way to worsen employee morale, thereby making workers more susceptible to union calls, is to batter a bank’s image through protest. 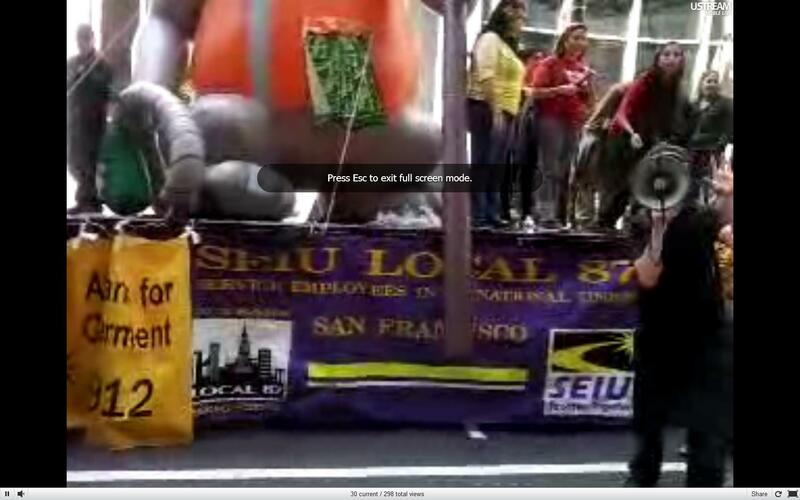 (SEIU officials say their anti-Wall Street campaign has nothing to do with their organizing efforts.) Complicating this picture is the fact that BofA is the union’s lender of choice — and SEIU, suffering financially, owes the bank nearly $4 million in interest and fees. Bank of America declined comment on the loans. In fact in March 2011, multiple news organizations including Business Insider and the Blaze reported on a tape of a speech from SEIU leader Stephen Lerner speaking at the Left Forum (a Leftist planning conference) about a plan to “destabilize the country” by bringing down banks and Wall Street, to cause a redistribution of wealth. This plan would have “community groups and other activists” taking the lead. Lerner noted how we have to take what we are doing now in Madison to Wall Street and do the same thing there. Sound familiar? Occupy, you weren’t co opted by the unions and the far Left, you’ve been their creation since the beginning. How does it feel to be ACORN and SEIU’s “personal army”? This entry was posted on April 27, 2012 by nickarama. It was filed under Occupy, Politics and was tagged with ACCE, Bank of America, BOA, Chinese Progressive Association, Nina Easton, Occupy, occupy SF, SEIU, Wells Fargo.